The A TEC low-NOx calciner technology sets a focus on a combination of avoiding NOx formation by an effective staged combustion calciner system and effective limitation of any residual NOx traces by an SNCR system. 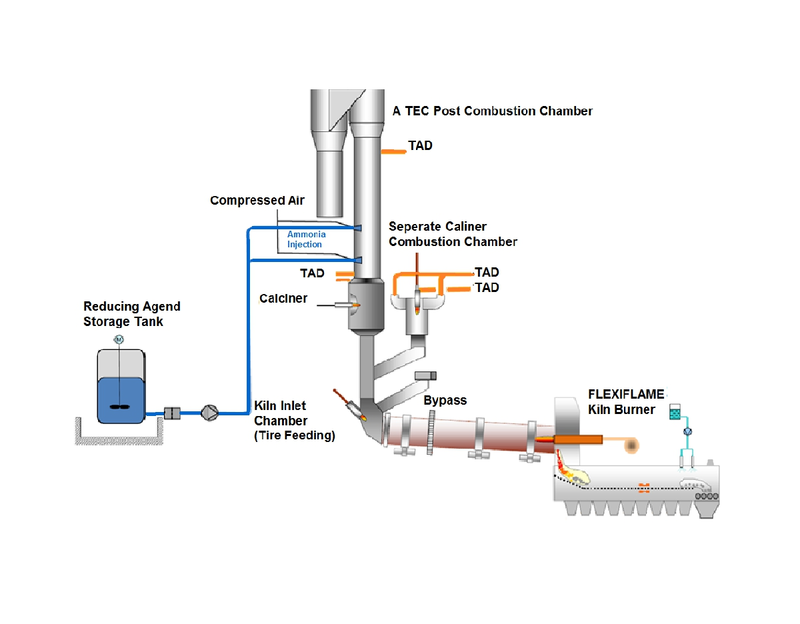 The A TEC calciner technology with staged combustion ensures highest NOx reduction by creating a defined reducing zone in the lower stage of the calciner where the high NOx loaded kiln gas can react with CO and fuel radicals. In the second stage the residual combustion air is added and the A TEC Post Combustion Chamber at the calciner top takes care of a complete combustion avoiding CO streams. With this technology – depending on the fuel quality – NOx values between 400 and 600 mg/Nm³ can be reached. For lower emission limits, an high efficiency SNCR system is used which only reduces the rest to the required limit. This ensures lowest emissions at lowest reducing agent consumption. The A TEC system is ready for NOx 200 mg/Nm³.